There is a reason that they call this the greatest outdoor show on earth. Every time I cross the tunnel on Day 1 at the Calgary Stampede I get chills down my spine, a fire in my belly, and an uncontrollable excitement to ride bucking horses. It’s everything. The upbeat atmosphere can’t help but overtake you with happiness and true thankfulness for the opportunity to be present. Ever since I was a little boy I dreamt of one day being able to compete at the Calgary Stampede. It has always been something for the elite. Now, after two years of competing at the Stampede, as well as many rodeos across America, I can say from experience that there is so much truth in the claim this event is the greatest outdoor show on earth. Calgary throws an upstanding event. The personnel, the hospitality, the crowd, the cowboys and cowgirls, the rodeo stock — all of it as at the very top of the rodeo chain. As I climb onto my bucking horse loaded in the chute, my nerves rise and I have to gather myself amongst a crowd that is on fire, cheering for a Canadian boy, my mind set on making the country proud and giving it my all. When you win a round at the Calgary Stampede, at the end of the rodeo, you get to walk across the main stage in front of the grandstand, with all the other winners, and get presented a bronze with your name engraved on it. What a thrill! The first round I won, I was in awe. I was standing with some of the most elite in our sport, about to accept a bronze myself. What a blessing, what an honour. Today, at 22 years old, with a couple of years of being invited to the Stampede, I have three go round bronzes, and Champion Bronzes for 2015 and 2016. The Stampede has a large purse for rodeo contestants. That is frankly, something you don’t often get as a rodeo athlete. It can be life-changing, the money you have the opportunity to win at this event. Being a rural Alberta boy, it is amazing to see agriculture come together at this event every year. Agriculture is a way of life. It is my lifestyle, with rodeo being at the forefront for me. But it’s great to be immersed in all the other aspects of agriculture that the Stampede brings out: the cattle shows, horse shows, dog trials, blacksmith competitions, even the art shows, all of it brings so much of the culture of agriculture together. It showcases a lifestyle that seems to be rarer nowadays. That’s incredible. Not only does the city of Calgary come together in outstanding fashion for the Stampede, so does the Province of Alberta and the country of Canada. Every time I check in at the Stampede, I am so proud to be Canadian. The event brings together people from all different backgrounds, introducing rodeo and agriculture to people that might never have even seen farm animals before. I am so proud of my Canadian and rural roots. After weeks of being on the road, “rodeoing” hard all over the United States and Canada, my wife meets me in Calgary with the camper and we get to take a much needed break for a week. Being spoiled by the Stampede’s hospitality, the chance to get on the absolute best bucking horses, spending time with family, friends and rodeo athletes, the week is picture perfect. 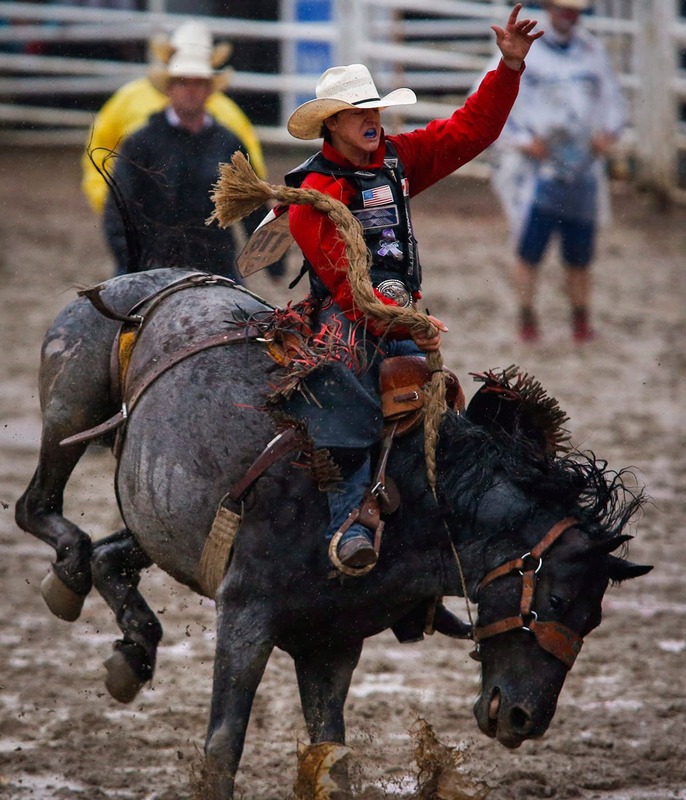 It is every cowboy and cowgirl’s dream to spend a week in Calgary for the Stampede. The Stampede has changed my life forever: the people that I have met, other rodeo athletes and spectators, and my winnings. The prize money has been huge in helping my wife and I set up our life in rural Alberta. My experiences in Calgary have helped me find a confidence and ability in myself I didn’t know I had before my trips to the Stampede. I come back to the horses. You just do not get many opportunities to ride bucking horses of the quality that the Stampede offers. A rodeo career will take you to a lot of beautiful places, but there’s nothing like coming home to the greatest outdoor show on earth.